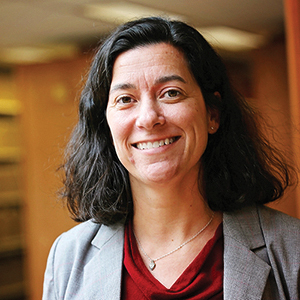 Kate Caldwell returned to the Maurer School of Law in 2019 after serving as director of career services in IU's School of Informatics, Computing, and Engineering from 2012-2018. Her work in career services began when she was a graduate student in the School of Education at Indiana University, where she completed an assistantship with the Arts and Sciences Career Services Office. She has a Bachelor of Arts degree in social work and psychology from Hope College in Holland, Michigan, and a Master of Science in Education in Student Affairs Administration from Indiana University -- Bloomington. Caldwell enjoys helping students assess themselves, specifically their skills, interests, values, and personality, so they can make satisfying and fulfilling career choices. She also enjoys assisting students with polishing their written application materials, learning how to network effectively, and with preparing for interviews. Caldwell has presented on a variety of topics to students, staff, faculty, and career services colleagues at Indiana University, St. Lawrence University, and professional conferences. She has managed a number of programs that work to connect students with alumni.